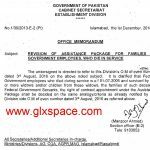 Government of Pakistan Cabinet Secretariat, Establishment Division has also issued the amendment in the Notification of Assistant Package for Families of the Govt Employees Who Die in Service vide Notification No. 8/10/2013-E.2 dated 22-10-2014 in connection with Retention of Government house or payment of rent for hired house for 05 years or till the age of superannuation which ever is later. 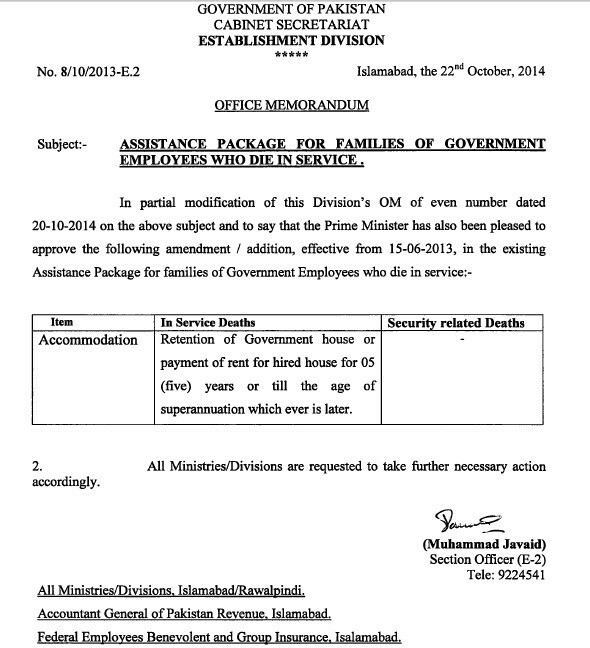 In partial modification of this Division's OM of even number dated 20-10-2014 on the above subject and to say that the Prime Minister has also been pleased to approve the amendment / addition, effective from 15-06-2013, in the existing Assistance Package for families of Government Employees who die in service. Special Thanks to Mr. Ayaz Ahmad. Is there any notification which set the time limit to apply for employment under Assistance Package. I have come to know that there is a notification that one can apply within One Year for employment in the concerned office otherwise the employment will not be considered..
Dear Hasnain I have also heard the same but not seen the notification. DEAR please tell me whether the WAPDA employee exist in this paackage or not? Please mujay ye batayega k kya Assistant package un families ko mil sakta ha jin k father contract pay Federal Govt. ma doran mulazmat wafat pa chukay ho. 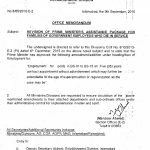 i am appointing in Pakistab Bureau of Statisitcs (Federal Government) w.e.f 12-08-2011 under family assistance package. 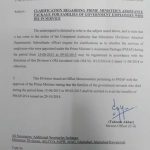 After satisfactory completion 02 year, i asked for regularized my post the department was informed " the case will be forwarded as when schedule of cabinet sub committee will be announced" and extended my contract period till August 2016 year wise. It is requested that please guide me to solve this matter in favor of employee. i shall be very thankful to you for this act of kindness. Dear Sohaib Hassan yes if he was a Federal Govt Teacher. Dear zahid manzoor according to my knowledge for the Federal Employees it is for 5 years maximum or at the age of superannuation. plz help me mein kon konse packages mujhe mil sakte hai? aur kaise? Dear Arifullah mujhay is ka confirm nahin hay. Thanks for considering my mail. now is the department bound for granting me such job of 17 scale or there would be some issues. Secondly when notification will be issued. Employers will get the plots or the desired amount alloted for plots. I hope u will be absolutely fine i have some questions regarding death package. My father died on 22nd april 2015 he was serving as a senior broadcast engineer(grade 17) in radio pakistan as he was a federal employee now the new death package which was on hold for a moment any expected time for its revised notification. when this notification will be issued then will it be implemented from last date when it issued or the date from when it is revised. do the previous death package have some plot allotment facillities during death in service. 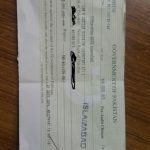 Dear nauman peerzada I hope soon the revised package will be issued and it is expected again from 15-06-2013 but there are chances for the revised amount and there are chances also for the regular service. It is better you apply for the job and if they granted you the job there are chances for the regularization of the same. Sorry dear BILAL AHMED i have not the list of the same. I have only for the Punjab & Federal Employees list. Dear Waqar Notification to jaari hua tha lekan wo Notification held hogia hay and hope soon the revised Notification will be issued. Dear Furrukh, the package is not completed removed. I hope the same will be issued in revised condition soon. However don't worry about the job. Your brother still can continue his job as there is available the existing package under that package the employee son/daughter is given job for two years on contract basis. Dear Adil Shah just wait for the revised Assistant Package Notification. the husband of my sister was died on 21-02-2014 & my sister submits death claim in light of "family assistance package" but after one year there is no progress. pl guide us accordingly. Dear zulfiqar ali malik plz email me all these details along with department/Government. Dear Tetani I ll confirm the same soon. Dear shumaila, you said "Dear Khan, you can see the Notification of the same at this website. You are eligible for this package." But i couldn't find that notification at this website. There is one but this is for Federal Employees. My father was provincial employees. When will punjab govt issue this notification and how can i get copy of this notification? 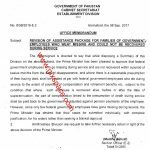 Dear Khan you are right this is for the Federal Govt employees but the job to the son/daughter is already granted by the provincial Governments under Rule 17-A. The Notification like this Notification of FG is expected soon by the provincial governments too. assalam alaikum ,dear sister my father has died on duty as dsp bhirya distt noshehro feroz .u make me understand that what kind of job sindh govt may give me .either sub inspector or inspector .muy father had promoted as dsp in march 2014 after demoted the out of turn promotions in sindh police ,my father devoted 27 years for sindh police .he had devoted a valuable service in police dpt,during service he arrested big murderer and face adventures.plz i request u to guide me about job .and send any sindh police notication ,sindh govt notification which may helpful my job . Dear Faheem you are entitled job from BPS-01 to BPS-15 according to your qualification. My father died on 12.7.12 and my joining date is 1.11.12 in the contract basis job and my contract will be expired on 30th of this month. Please advice either we are falling in this package and what about my job. Status will be extended or may be permanent. Please advice. Dear Ilyas Khan this package stared wef 15-06-2013. U r not falling under this package, but I hope they will do some. U should apply for the extension. Madam, Can u give detail about this pkg announced by pm at 23 October? Or tell me which department to contact for detail? Dear I will reply the emails on Monday as i was busy. You should apply for the same packages through the office. PM announced this package at 23 october. Did they issue notification of this pkg? If yes, do u have copy? Dear Khan I could not understand your question. Dear Khan, you can see the Notification of the same at this website. You are eligible for this package. in case of failure to die within 60years ,the benefits are very minimum,no plot,no lump sum grant and other benefits are entitlement to the employes attaining the 60 years . The benefits to the employee who attained the age of superannuation should also be enhanced and plots etc should also be given to the retiring officials. 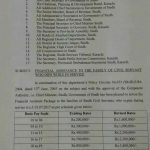 Dear Abdul Salam, I hope soon the Sindh Govt will also issue the same Notification. kindly clarify whether it will also be implemented for provincial government also or federal only? Dear Omer Zafar filhal yeh Notification Federal Govt ka hay. I hope provincial Governments will also the same Notification.